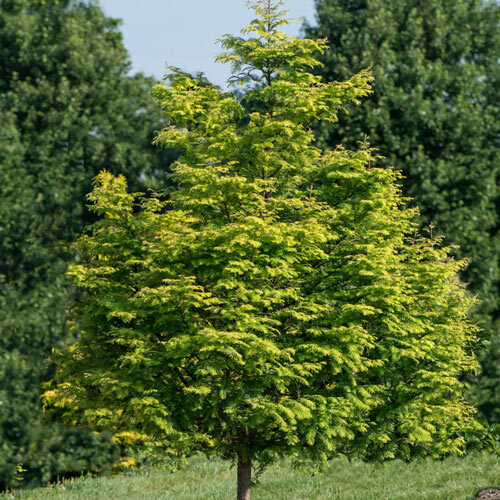 Unique CharactersticsStar: Amber Glow™ shows off bright golden foliage with hints of burgundy in the spring and gains an attractive orange color in the fall. The golden foliage holds up well in the heat and doesn't burn in full sun. Plants maintain a dense, pyramidal habit and mature to a more compact size than other gold foliaged commercial varieties. At about 25 years of age, Amber Glow™ can reach heights of 30-35 feet. 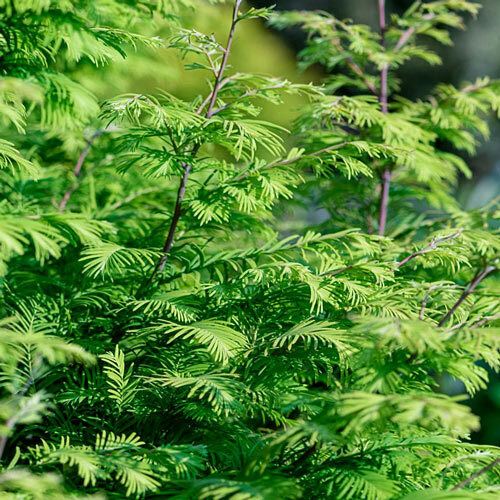 SUBHEAD: A golden Dawn Redwood that thrives in the sun META TITLE: Metasequoia Amber Glow - Dawn Redwood | Spring Hill Nurseries META DESCRIPTION: Quick-growing, Amber Glow dons bright yellow foliage with hints of burgundy in the spring and lovely shades of orange come fall.